Team Israel wearing their kippot during Hatikvah before the game against Great Britain on September 22, 2016. Photo courtesy of Wikipedia. 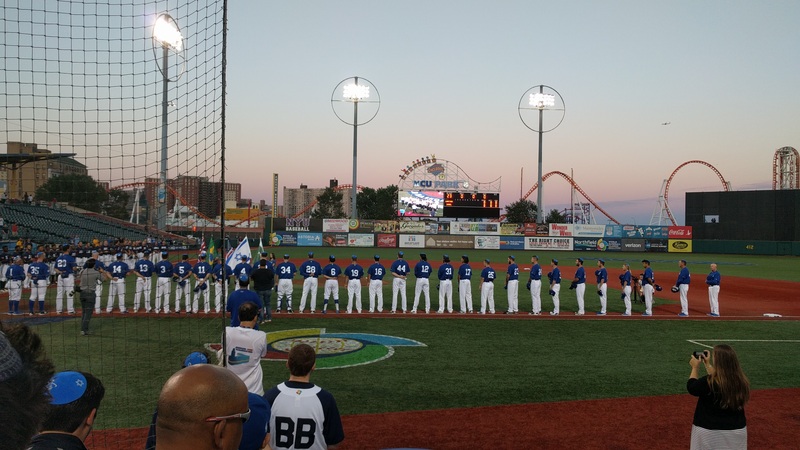 Ten Jewish-American baseball players gained Israeli citizenship last month so they will be able to represent Israel in the 2020 Summer Olympics in Tokyo. Peter Kurz, president of the Israel Baseball Association, sought out a number of retired players, free agents and players in the Independent League in hopes of fielding an Olympic-qualifying team. He assembled a roster of 10 Jewish-American players who are now Israeli citizens and eligible Olympic athletes. The team included five players—Corey Baker, Gabe Cramer, Blake Gailen, Joey Wagman and Alex Katz—who had previously represented Israel in the 2017 World Baseball Classic (WBC). The remaining five include retired and free agent minor leaguers and players in the Independent League. One of the five players, Jon Moscot, pitched for the Cincinnati Reds for two seasons and is now a free agent. “To be able to go back home to the roots of the religion and be a part of something bigger than myself in respect to baseball and the Jewish community—I thought that was a really cool opportunity,” he told the Jewish Standard. The chances of Team Israel competing in the Olympics once seemed like a pipe dream, but their impressive performance at the WBC shows promise. Though the underdogs entered the tournament as the 41st seed, they worked their way up to a sixth place finish. With only six slots in the 2020 Olympics, Team Israel hopes for a top-tier finish in qualifying rounds. As Kurz builds an Olympic-hopeful team, he also seeks to build up baseball in Israel. “We want to keep expanding and growing. That’s the most important thing,” he said in an interview with The Jerusalem Post. In order to popularize the sport, Kurz has been holding fundraisers to raise money to build more fields. In addition, a documentary about the team, “Heading Home: The Tale of Team Israel”, was released earlier this year and has contributed to their growing popularity. Lindsey Capitelli, a junior accounting and information systems major, went on a Birthright trip in Israel this past summer and saw the 2018 film. Bar Itzhak, a senior business management and entrepreneurship major, studied abroad in Tel Aviv this past spring and now has more of an appreciation for his Israeli heritage. Already an avid MLB fan, he started following international baseball when Israel started gaining recognition. No Replies to "Israeli baseball team adds Jewish Americans to Olympic-hopeful roster"